Embassy Suites Kansas City/Olathe is situated at the intersection of K-10 and I-435 in the heart of Olathe*s business and retail district. 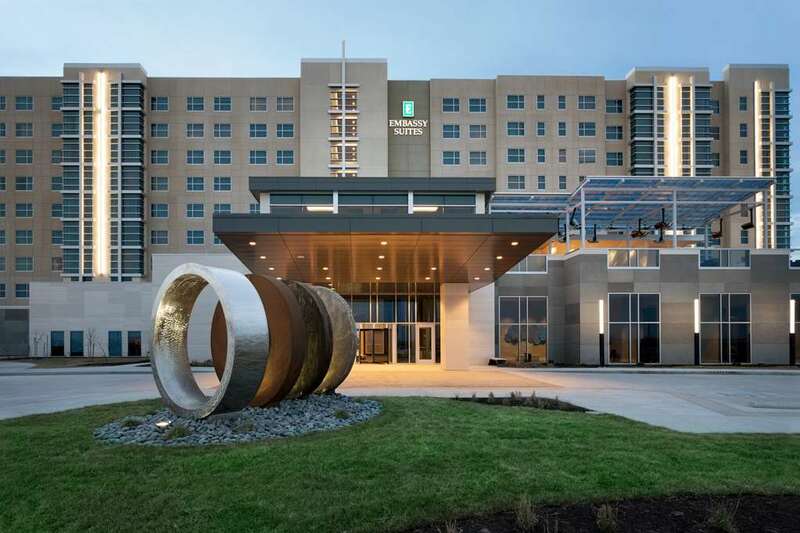 Our stylish full-service hotel is just 15 miles from downtown Kansas City and enjoys convenient highway access to lots of restaurants bars sports facilities and shopping options. Corporate guests will appreciate our close proximity to local businesses in Lenexa and Overland Park and corporations including John Deere Kiewit AIG and Farmers Insurance. In addition we are only 30 minutes from Kansas City International Airport and Lawrence Kansas. Ideal for meetings weddings and social functions the attached Conference Center boasts over 24 000 sq. ft. of flexible meeting and event space designed for groups from 8 to 1000. Stay productive at this extended-stay hotel in Olathe KS in the 24-hour Embassy BusinessLink Business Center. State-of-the-art audio/visual equipment and our experienced Meeting Professionals will work with you to ensure your event is successful. Each of our suites features a private bedroom and a separate living room with a sofa bed. Stay connected with WiFi and feel at home with two flat-screen TVs a refrigerator and a microwave. Start your day with a complimentary cooked-to-order breakfast and take advantage of our complimentary Evening Reception*. Unwind in the inviting J BAR where you can sample craft beers and signature cocktails on the patio. Energize in our contemporary fitness center or swim in the sparkling indoor pool. *Service of alcohol subject to state and local laws. Must be of legal drinking age.